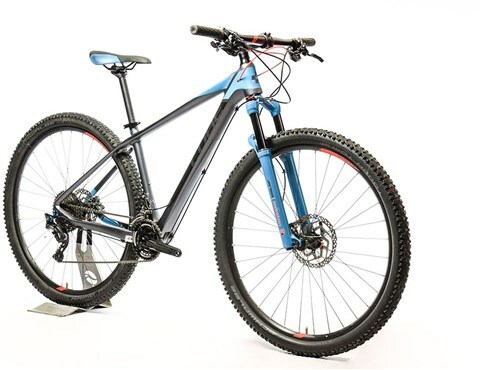 This Cube Reaction GTC 29 mountain bike has previously been returned to us by a Tredz customer. As a result of its use, the bike is showing signs of wear, with the usual build-up on the drivetrain. In addition, there are marks in several areas on the frame, including the seat & chainstays, top tube, downtube, headtube, and on the fork & stem. The bike remains in excellent working condition and has undergone a thorough inspection by our professional mechanics. As with all our bikes, it comes with a 12 month Tredz warranty, plus any additional manufacturer warranty which may apply. The Reaction GTC twin mould frame offers everything you'll need from a top carbon frame. Stiffness-enhancing features like the large frame profile, tapered head tube, PressFit bottom bracket shell and X12 quick release axles at the rear combine to offer powerful drive, high steering precision and light weight. The 27.2mm seat post offers added comfort, while the Direct Mount derailleur system, front mech design and internal cable routing are all state-of-the-art. Agile Ride Geometry offers maximum riding fun. The Reaction GTC 2X with Manitou's 100mm travel M30 - kitted out here with stylish black legs - offers the perfect blend of comfort and control. Shimano BR M355 hydraulic disc brakes give reliable, powerful braking. The Shimano XT 2x11 gear components - including XT Shadow Plus rear derailleur - are both versatile and reliable, while the Race Face Aeffect SL double chainset (36/26) gives this bike an air of exclusivity. The wheelset, featuring durable Deore hubs laced to Alex ZX24 rims, and a performance-orientated but comfortable CUBE saddle, round out this performance hardtail.